The AHertford Windsor Bench is one of our best-selling benches. Use this Windsor bench in your home or office. All of the beautiful Windsor Benches at DutchCrafters are Amish handcrafted in your choice of oak wood or cherry wood. The Windsor bench is carefully finished for a magnificent appeal. 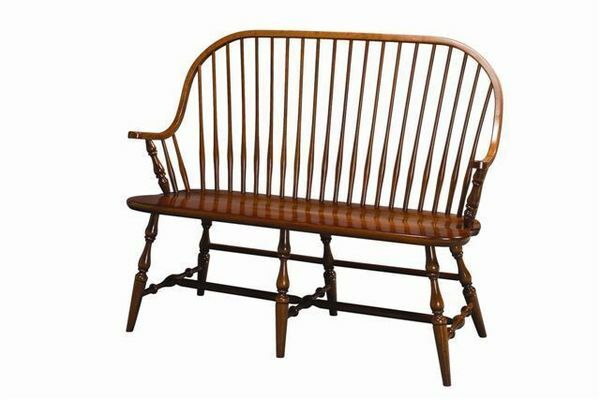 Many Windsors chair styles started in the Philadelphia area, but one exception is the AHertford Windsor Bench style. This Amish made Windsor bench has the beautiful continuous arm rail that is is steam bent downward then forward to form the continuously curved arm. Thank you for the note and the lovely hand made soaps. That was a very nice surprise. The bench is absolutely beautiful!! Superb. I really love it. Thank you so much. those who handled the order to the people who delivered the bench. Everyone has been terrific. Recently, trying to find the perfect gift for our daughter’s 40th birthday, we happened across your website through a Google search for “New England Windsor Bench”. Long a fan of Shaker and Amish craftsmanship, we placed an order, and were very happily surprised by the professionalism and follow-through displayed at every step of our transaction by your sales representative, Daina Crafa. Ms. Crafa exhibited a level of genuine concern and knowledge of her product line that is sadly rare these days. Our daughter was thrilled when she received her bench. We were thrilled at the extra effort that got it delivered AHEAD of time, both from Ms. Crafa and the delivery trucker, a Mr. Garry Blevins. All together, it was a very satisfying and enjoyable transaction. We look forward to doing business again with JMX companies. Thank you for doing such a good job in selecting and training your staff.